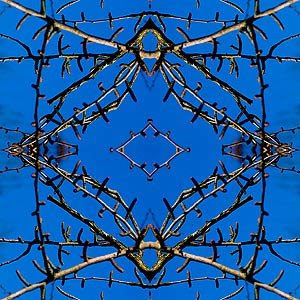 Mirrored Ginkgo branches on Flickr by Katy Silberger. * Added 4 objects on my Art-page (gallery): Art nouveau plate belt by Brandt, Art nouveau banisters by Louis Majorelle, facade Escoles Prat de la Riba, Reus (Modernism) and a postcard with mural by Sarah Spurgeon, Ginkgo Petrified Forest Museum. * New photo photospecial page: Gardens of Valloires Abbey "Evolution garden": c. 100 Ginkgo trees. 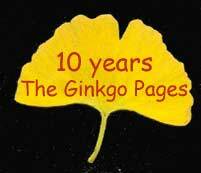 * Update of Awards-page with information about The Ginkgo Pages + 10 years The Ginkgo Pages (several pages). 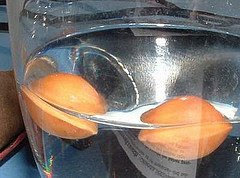 How long can a Ginkgo seed (nut) be kept (without removing the hard shell)? VisualWikipedia is a visual, intuitive, and interactive web interface to encyclopedic knowledge/information. It is designed to provide a fun place to learn stuff in an efficient manner. Visual Wikipedia adds context to Wikipedia articles by showing you relevant videos from YouTube. It is a reference source for students in elementary school through high school and beyond. It is a completely separate entity from Wikipedia.org with no association with it. Visual Wikipedia also has an entry for Ginkgo (biloba). 1999 - 2009: 10 years The Ginkgo Pages!! So far over 3 million people visited my homepage (English version). "Ginkgo biloba" for euphonium solo, composed by Hiroyuki Yamamoto, using several extended technics of euphonium. More information about its history and contributors: click here.